It was not the easy road, or the path most traveled. There were many times when I could have thrown in the towel. But I wanted to prove that it didn’t matter when I started kicking, it didn’t matter that I was a walk-on, it didn’t matter that I played at a small school. I believed I could do it and set out to prove it. Striving to perfect my craft, I was obsessed with learning everything I could to be the best I could possibly be; mind and body. Never being satisfied with my current situation I was constantly setting, achieving and revising to greater goals along the way. But ultimately I made it to that NFL stage because of hard work, determination and my belief in myself. Growing up I was not a football player, I spent the majority of my time from a very young age playing soccer and that continued throughout high school. I had a good leg and always seemed to be the kid on my team taking all of the corners and free kicks and enjoyed playing on a very competitive club team. Even though I did not play football, I was always a passionate fan of the game and I wanted to be a part of it. There is something about the way football can bring entire communities together that separates it from the other sports in high school. There is such a distinct energy at a football game, that electric atmosphere was something I craved. After my varsity soccer season during my junior year at St. Anthony’s High School, I felt that I was burnt out and had lost my desire to continue playing soccer. After speaking with a few friends, I understood that the football team needed a kicker. However, I still wasn't completely sure if it was a good idea to give up on a sport I had been playing since I was three. That winter kicker Adam Vinatieri became a star by making two legendary kicks through a blizzard in the NFL playoffs. Vinatieri then went on to kick the game winning field goal to win Super Bowl XXXVI just two weeks after that. I distinctly remember, watching the replay of the game winner from 48 yards over and over again that night, and I thought, “I could do that.” I wanted to be that guy, I wanted to do that. So, having no knowledge of what being a kicker entailed other than what I watched on TV, I decided that I would give football a try my senior year. For some reason I had the trust in myself to figure it out along the way. It ended up being one of the best decisions I have ever made. The coaching staff at St. Anthony’s was very welcoming and encouraging when I expressed my interest in being part of the team. It was made clear to me though that I could not just be a Kicker, and that to be a member of the team I would be required to play another position. So in a matter of a week, I quickly went from being a midfielder on the varsity soccer team to an aspiring wide receiver and kicker for the premier football program on Long Island. My parents would admit to me several years later that they thought I was crazy to make such a bold decision. But I am very thankful for their support despite the fact that they did express some concern. Fortunately, I was able to become the starter at both positions. Our team finished the season undefeated winning the championship game against our biggest rival. It was a great thrill and was very satisfying to have been a part of such a great team. I attempted three field goals that fall season but split the uprights only once, from 27 yards away. With this modest level of success, I had no expectations to kick in college. Like most of my teammates, I thought my football career was over. 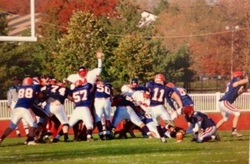 I was an above average high school level kicker at best, and I hadn’t put the time in to learn the proper way to kick. 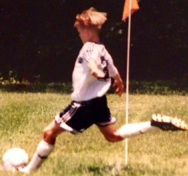 It was clear that I was a soccer player kicking, not yet a Kicker and I lacked what we all strive for, consistency. I had two small schools express some interest in me playing for them but I was willing to continue on to college as a student and leave athletics behind. A full year later I was watching the Super Bowl in my dorm at Boston University. Adam Vinatieri once again came on the field and drilled a walk off game winning kick for the Patriots. Once again I had the feeling in my gut that I could do that, and more importantly, I wanted to. I had it in my mind that if I worked really hard at it and learned as much as I could, that I could be a pretty good kicker and wanted to give kicking another try. 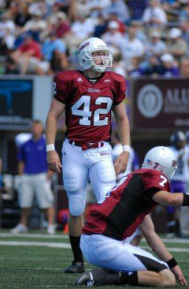 I never truly committed myself to being a kicker and I wanted to see what would happen if I did. Boston University does not have a football program, so to do this I had to pursue it elsewhere. That summer I walked into head football coach John Anselmo’s office at Nassau Community College, I Introduced myself, explained my story and told him I would be trying out for the team. Luckily I was good enough to make the team, but still needed to improve in all areas in order to get on the field. I was patient and focused on getting better. That would be my only way to get an opportunity to play. Within the first month of the season I had established myself as the kickoff specialist. The following year would be my year to be the placekicker and punter as well. I dedicated myself to improving physically and technically that off season. This was going to be my only opportunity to show what I could do and hopefully be recruited by a major college program. I was incredibly optimistic heading into my sophomore season at Nassau CC. I was in the best shape of my life and was better kicker than I had ever been to that point. I was very excited and eager to start the season strong and show what I could do. Unfortunately an early season foot injury held me back. I continued to play each week, but my strong and explosive leg that I hoped would help me get noticed had become average, as it was painful every time my foot hit the ball. The season ended in November and I did well, but my game film and statistics were unremarkable for the most part. I was able get in contact with a few schools including UMass but none of them seemed very interested or serious in recruiting me. Once again I thought that my playing career had run its course. For a brief moment I thought of giving up. Luckily my mother wouldn’t let me give up hope yet and registered me for a kicking competition for the first week of January. It was the College Exposure Camp run by Special Teams Solutions and it would be the last opportunity I would have to impress college coaches. My foot had healed and I was able to kick at full strength for the first time in months. I made every kick I attempted that afternoon and I won the competition. Spring football was my first chance to compete for the starting job, but there was another bump in the road. I suffered a knee injury during one of the first spring practices. I had a torn meniscus in my left knee and I would be out for the remainder of spring. I had surgery on May 5th which gave me only three months of recovery time. Getting this far, I wasn't going to let this stop me. I was determined to come back and be ready to go for training camp. All summer I rehabbed my knee and trained relentlessly. I wasn't able to start practice kicking until July, but I was still confident in my abilities and that I would find a way to be ready. August had arrived and it was time for football. Honestly there was still an element of doubt in my mind. But I wouldn't allow myself to dwell on that. I was just trying to focus on what I had to do each day to continue to get better and compete. I continued to progress throughout camp and my confidence continued to grow each day. I got into a really nice groove by the second week and never looked back; I was kicking better than ever. The week before our first game, our head coach Don Brown asked to speak with me in his office. He told me that I would be the starting kicker and that he believed I had earned a scholarship. It was a moment that I would never forget. I was incredibly proud and thankful that I all of my hard work and perseverance over the past three years had finally been rewarded. 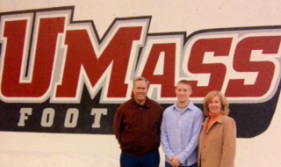 My first season at UMass was an incredible experience. One of the major reasons why I was interested in UMass before they had truly shown interest in me was the fact that the team was ready to win now. I had only two years of eligibility left and wanted to join a program that was on the upswing. Narrowly missing out on the I-AA playoffs the year before, this team was on a mission to go the distance in 2006. We started the season strong stringing together wins week after week. 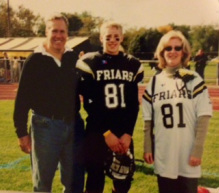 Our only loss came in a narrow defeat to the Naval Academy where I made my first two career field goal attempts. We steadily rose in the national rankings and received the third seed in the playoff bracket. Playoff games are going to be highly competitive and more than likely to be decided by one score. I was excited for the prospect of that happening; I wanted it to all come down to me. The idea of making that kick with everything on the line is why I decided to be a kicker. That’s what you train for, that’s why you practice all year round for moments like that. If you find yourself not wanting to be in that position, being a kicker is probably not for you. We won our first two matchups at home and advanced to the national semifinals. We would have to go on the road and travel to play the second seeded Montana Grizzlies, a team that had not lost at home in 15 years. Our team was very confident and excited that we could be the team to end that streak. The game was set for a Friday night on ESPN2. It was December 8th 2006 and was one of the most memorable experiences of my life. Montana was known for their home field advantage. Much like the Seattle Seahawks today, their fans were incredibly loud, and their stadium was set at the base of a mountain that created a natural amphitheater, the noise was unimaginably loud considering their stadium only held 34,000 people. There was also the small fact that it is incredibly cold outdoors in Montana in December. Later in the game we were driving down the field and ended up with a fourth down from the 26 yard line. I trotted out on to the field to attempt a 43 yard field goal from the left hash. I didn’t hit it great, but I hit it straight and looked up as the ball landed in the first few rows of the stands, directly between the uprights. I made it. I will never forget the volume of the crowd as I lined up, or how sweet the sound of their immediate silence was after the kick went through. The next thing I remember is my teammates swarming me, congratulating me by hitting me on the helmet. We held on to win the game 19-17 and were headed to the FCS National Championship game. Although we came up short with a 28-17 loss the next week it was still a magical season and the Montana game is something that I will never forget. At the end of the season, I was fortunate enough to be named an Honorable mention All American and All-Conference in the Atlantic 10. Even though I had a successful season personally, I wasn’t satisfied and I still felt that I wasn’t getting everything out of my ability yet. I knew I could get better and was committed that off-season to do so. I didn't want to just be a good college kicker; my goal was always to reach the NFL, and to do that I would have to perform at a higher level. That summer was the first time I started filming myself when I kicked. I started to finally understand concretely what I was doing compared to what I thought I was. Also watching film allowed me to understand what I wanted to accomplish and gave me a true representation of my progress. I was able to study kicking technique from a different perspective and made the most progress I have ever made in one year because of it. Film study was definitely a key element that contributed to my success from that point on. My senior year went by quickly. We had a very good team but not quite as good as the previous year. We made the playoffs but lost in the round of eight. Prior to the 2007 season, the Kickoff was moved back to the 30 yard line in college football. I was the only kicker who had more touchbacks from the 30 than from the 35 the year before. I finished the year with 21 touchbacks, which was first in the country. I was asked what I did to get “stronger” but it was not my strength but my technique that improved enough to finally use all of the power I already had. In my opinion, not enough kickers give as much attention to their Kickoff technique as they do to their field goal technique. I would make sure to always treat them with equal importance going forward. Looking back on my college career, my greatest strength and key to my success was my body awareness. I was able to learn something new and apply it quickly as well as self-correct any minor mistakes on the fly. My attention to detail in my kicking technique allowed me to do this. That allowed me to trust that I could continue to grow and raise my performance until I was good enough to perform at an NFL level. I wasn’t content with where I was and focused my efforts on improving, because I always felt I could get better. Having started kicking so late I felt I still had plenty of room to grow. I was patient and knew just because I didn’t have any opportunities right away didn’t mean that I wouldn’t have a chance at the NFL down the road. I decided to play Arena football when the opportunity presented itself. I played for the Manchester Wolves in New Hampshire in 2008 & 2009. It was a chance for me to focus on improving my accuracy due to the fact the uprights were only 9 feet wide compared to the 18 feet 6 inches of the NFL and college. However, playing indoors in small arenas provided many obstacles for me and I realized eventually that Arena football didn’t highlight my strengths. Outdoors my greatest asset was my strong leg, which I hoped would help me get to the NFL. My size and strength helped me to be able to be very effective in all weather and wind conditions. The great height and trajectory I had on kickoffs and field goals ended up hurting me indoors where rafters, curtains and speakers were a constant threat. When I had a game winning field goal attempt from 37 yards hit a speaker a split second before it went through the uprights, I finally realized I had enough of Arena Football. I hit it perfectly; it was going right down the center until it deflected off of the bottom of the speaker and went to the right. We lost 53-51. After the season ended I figured there were better ways for me to gain some exposure and catch the attention of the NFL scouts. There are a handful of free agent combines hosted every spring in different warm weather locations where 40-50 Kickers come together and compete in front of many NFL coaches and scouts. These combines were valuable for me because although I did have a successful college career I wasn’t at a big name school and I only played two years so I was a relative unknown. The combines allowed me to kick side by side with all of the more well-known kickers from every big time school there is. Being in that group and outperforming a lot of my competitors is how I began to get on the scouting radar of a few NFL teams. In the spring of 2010 I got flown in for my first legit NFL workout by Tampa Bay. Even though I did not sign with them, it was a positive step in the right direction and it elevated my status among the teams around the league as a possible candidate to be brought in for a workout. 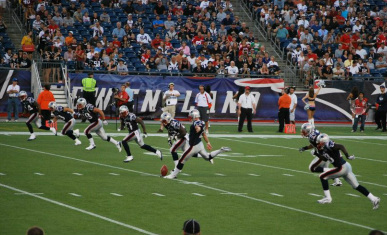 There are only 32 jobs in the entire world for NFL Kickers and it is incredibly competitive. There are only a handful of those spots each year that are up for grabs. When you are on the outside looking in, all you really can ask for is to be given an opportunity to kick in front of the people who make the decisions for these teams. That’s how you make it. With a renewed sense of hope and purpose I continued to train knowing I could still get better. I had to be ready for my next opportunity. Preparing for an elusive phone call that you are never sure if or when it will come is difficult. But I kept the faith and I performed well while attending combines and competitions throughout the year. In the spring of 2011, the NFL Lockout started and the teams were not allowed to sign any new players until it was settled. There was a great deal of uncertainty as to how long it would last but midway through the summer there was an agreement between the owners and the players union and the NFL was set to resume business as usual. An agreement was reached that would end the Lockout on Tuesday July 26th at 10am when each team opened the doors of their facility again to their players. That morning started the same as almost every other day that summer for me but it ended up being one I would never forget. I was working at a gym as I had been for the past two years. I was in the middle of a session with a client when I saw I had a missed call from an unknown number that left a voice mail. About twenty minutes later I was able to check my phone in the break room. I was ecstatic and quickly got my things together and went to my car to return his call. That night I arrived in Foxboro, Massachusetts at the team hotel for training camp. I signed my first NFL contract and was on the practice field the very next day. It was a complete whirlwind, everything happened so fast. It was an incredible feeling and honestly a very emotional moment. It had been a long winding journey but all the hard work and dedication had paid off. I finally made it to the NFL. Looking back, I am incredibly proud of everything I was able to accomplish. What I’m most proud of is the fact that I overcame several setbacks and persevered when others may have quit. My persistence was due to the fact that my goal from the very start was to reach the NFL. My desire to compete as well as the opportunity to prove to myself and others that I could do it is what drove me above all else. Ultimately, it was my belief in my ability and determination to achieve my goal that made my success possible. If you believe you are capable of something, go for it and don’t let anyone stop you from trying. You never know, you just might get there.